Dark blue kitchen cabinets. 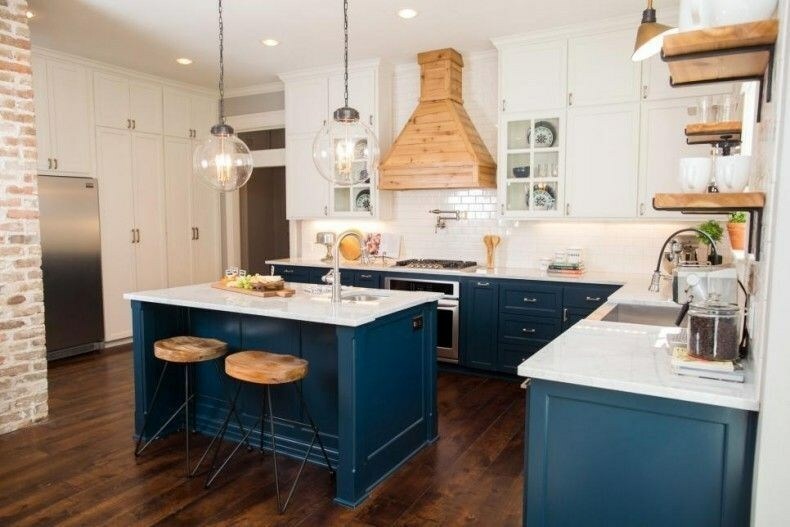 Navy blue is emerging as the year’s hottest kitchen color. Not ready to repaint your cabinets? Redecorate with blue linens, curtains or chair covers. An old favorite is back, especially in textured versions and wall murals. Fringes and tassels. They’re a natural on curtains and pillows, but lately they’ve also been seen hanging from mirrors and drawer pulls. Scalloped edges. You’ll see these on chair backs and in fish scale tile patterns that recall aquatic shapes. What could be more aquatic than sea-blue scalloped tiles that remind us of fish scales and ocean waves? Mid-century modern furniture. The clean lines and natural materials of these pieces fit perfectly with the current taste for light wood tones and simplicity. Warm neutral walls. Beige, cream and other warm neutrals are making a resurgence. These colors are timeless and adaptable. Even better, warm neutrals make the perfect backdrop for today’s popular natural materials like basketry and light-colored wood. Plush velvet adds a sumptuous touch to sofas, upholstered chairs and headboards. Quilted or textured velvet bedding is also on trend for 2019. Tropical patterns and colors. Large leafy patterns, bright greens or reds and a touch of sky blue create a warm tropical vibe on wallpaper, fabrics and rugs. This trend includes live plants like large-leafed philodendrons, rubber trees or flowering bromeliads. Tribal and Native American themes. These can be expressed subtly as earth-toned tribal patterns or more directly in the form of handmade artisan pottery, baskets and fabric. Geometric designs. Geometric patterns can be soothing and stimulating at the same time. Look for them in art pieces, area rugs and fabrics. For a calming effect, go with simple black and white graphics or low-key colors. If vibrancy is what you’re looking for, choose patterns with a multitude of primary colors. If you dream of decorating a brand new home, call Landon Homes today at 866-898-3603 to tour our communities of new homes in Allen TX.